For the 61st edition of the London Film Festival, the BFI has chosen Breathe as its opening film. 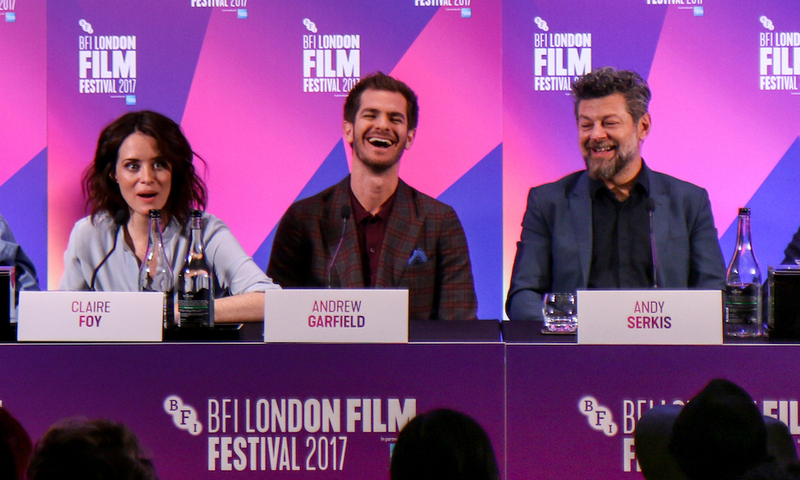 Andy Serkis’s directorial debut is a period drama starring Andrew Garfield and Claire Foy. On the day of the European premiere, the creative team and cast held a press conference to discuss the film which tells the true story of Robin Cavendish, who at the age of 28 in 1958 contracted polio and was left severely disabled. Robin is paralysed from the neck down, confined to a hospital bed and respiratory machine to breathe for him, and given just months to live. He wishes to end his life but his pregnant wife Diana (played by Claire Foy) refuses to accept his wish, and after the birth of their son, together they defy all odds to find a fulfilling life for their family. Beautifully shot, Breathe, despite its subject matter, is full of wit and British stoicism, buoyed by some brilliant supporting roles from national treasures Tom Hollander (Diana’s twin brothers), Hugh Bonneville (the oddball scientist Teddy Hall who invents Robin’s, and the first ever, respirator-installed wheelchair) and Stephen Mangan (the doctor who helps Robin bring his revelations on living with a severe disability to the wider world). While bordering on twee at moments, and skirting over some tricky subjects of class and privilege, its overarching sense of positivity in the face of adversity, the importance of quality of life (with the sterile living morgue of a German hospital put into stark contrast with the raucous parties and dry humour enjoyed in the old English Cavendish household) and of those with a disability being integrated in a healthy society, lift it into a enlightening watch. Andrew Garfield described drowning in a puddle of his own tears when reading the script, convinced immediately he wanted to be involved in telling this moving story. The role was not without its challenges, with only his face available to him to convey emotion, the movement and expressions in his mouth and eyes becoming critical. Although he admits not being familiar with Foy’s previous work, he spoke emphatically of finding such an incredible actress to work opposite, with whom he shares a palpable chemistry on screen with. When asked if this in fact, rather than Spiderman, was the ultimate superhero role, he readily agreed. Claire Foy was stereotypically down to earth in her reflections on the film. For her, it was also a no-questions-asked situation after reading the script, the ending of which she never reread until shooting the scene as she found it to be so emotional. Intending to take a break after a critically-acclaimed run in series The Crown, and not yet well-experienced in feature films, she just felt she would be mad to turn it down. Andy Serkis explained how he came to direct the film, in parallel with his other debut film The Jungle Book. A pioneer of motion-capture technology and innovative approaches to filmmaking through his venture Imaginarium, the traditional period-set biopic could be seen as something of a contrast, if not a complete surprise in choice. But after reading the script he was certain it was a film he had to make, for him, capturing a universal message of positivity overcoming tragedy, with the couple and their tight group of enablers laughing in the face of adversity, an aspect that emerges strongly from the film which he summarises as “inspirational” and “witty”.